Shorts and orange Crocs will never grace the pages of GQ. Enough said. I never cared for Mario Batali much on Iron Chef, but mainly because Bobby Flay outshone him. Mario was too pastey white. I feared a drop of sweat might fall into a pasta dish, or a piece of two-foot strawberry blonde hair. He’s husky and does not look at all like what Americans think Italians are supposed to look like, which is Guidos or disco dancers from Saturday Night Fever. Most folks would quickly label him Irish, though it’s probably the French Canadian that we’re seeing. Only Bobby is Irish. So when The Chew started airing on ABC, I was more excited about seeing my boy Clinton than Batali, freak-flag-flyin’ Carla, holier-than-thou, kale-chip-eatin’ Daphne, or Michael of the obnoxious laugh. Seriously, nothing is THAT funny. But they grew on me, and seemed to have a certain chemistry. Nonetheless, Mario’s style remained horrendous and frozen in time, and even Clinton hasn’t yet been able to remedy that. 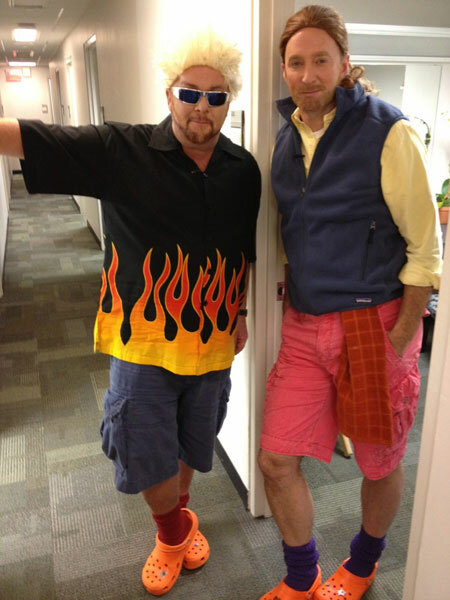 Check them out at Halloween, with Batali looking oddly svelte. Then last May, he and his family ate a week of meals on a food stamp budget of $124, and he purposely did not taste the dishes on the show to keep it real. People were swayed to him, where before they had found him a bit uppity. Eating rice and beans each day for lunch can do that. Sometimes he will do gentlemanly things like pull a chair out for a woman, or describe a regional cuisine in terms that can make you melt. And just listen to how he says “ricotta,” like he and ricotta have been friends since birth, like they share an intimacy you will never know. And what about Molto Mario quotes? He said, “I can teach a chimp how to make linguini and clams. I can’t teach a chimp to dream about it and think about how great it is.” Sigh. Then you see how passionate he is. When asked what his last meal would be, he answered, “My last meal? The food would be much less significant than the company.” And then you want to beat your head with a frying pan for ever being so shallow. But apparently it didn’t take The Chew to win the hearts of other ladies. Elizabeth Bastos wrote a shameless love letter to him way back in 2009. If you want to hear more questions like “Do you want simply to crack your farm-fresh pullet egg into my mound of fresh semolina on the table and make homemade pasta?”, then you should check out her letter at: http://foodnetworkhumor.com/2009/11/a-love-letter-to-mario-batali/. One woman responding to the post said she’d like to “sop him up with an Italian loaf dripping with EVOO.” Wow. Well, I won’t go that far–not even close–but I will admit I can see why someone did agree to marry him and bear him sons in great pain. He’s got the skills, the knowledge, the experience, and the passion. Previous Now is ze time on Sprockets vhen ve dance! I have always gotten a kick out of him.